Inside Scoop: A healthy mayo-free coleslaw that still contains a creamy (and dreamy) dressing that will rock your world. 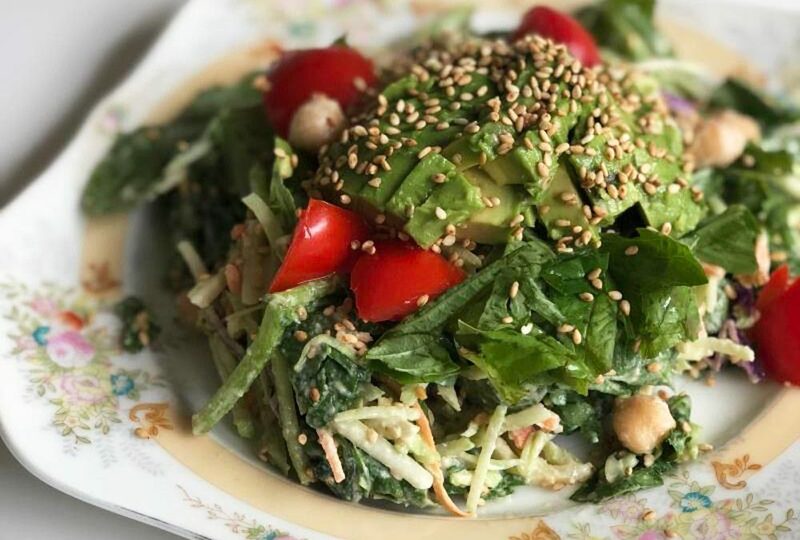 This recipe was submitted by Joey Bruno, Thrive Cuisine’s Nutrition Researcher with a Masters in Food Science & Nutrition and wanna be vegan chef. Coleslaw or slaw, this traditional Southern side dish often comes overly-laden with mayo and served beside a sandwich or fried chicken. It’s usually thought of more as a condiment than a dish of its own, and in all honesty, when we used to think of the slaw, it wasn’t a dish that we would consider to be all that healthy. With a little creativity, though, slaw can be made into a salad that can truly shine as a main dish. Give this mayo-free coleslaw recipe a try and see just how satisfying and delicious slaw can be. 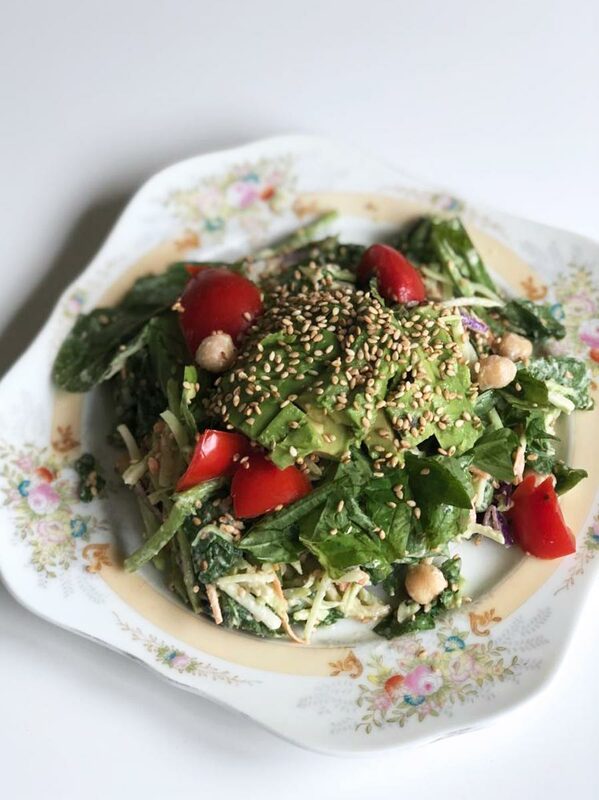 This mayo-free slaw recipe uses nutrient-dense foods like shredded cabbage and broccoli stems, which helps you get a meal that is both filing and nourishing. These are also inexpensive ingredients that can be picked up pre-cut at most grocery stores, making it an easy meal to keep on hand for busy weeknights. Our favourite slaw hack is buying the pre-shredded coleslaw bags, and in a lot of cases nowadays, these bags often contain ingredients like kale, beets, and cruciferous veggies. Alternatively, chopped stems of broccoli can usually be found in their own independent bags, or mixed with carrots and other long-cut vegetables. If you can’t manage to find it pre-cut for this mayo-free slaw, you can easily use a knife, food processor or dicer to get a chopped shape on almost any veggie, but it’s obviously not as quick. WHEN IT COMES TO COLESLAW, THE DRESSING SHOULD BE THE STAR! 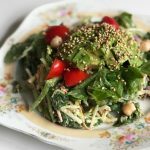 With a mayo-free coleslaw recipe, you really need to compensate by finding a dressing that can make up for the removal of the mayo, which is loaded with flavour. 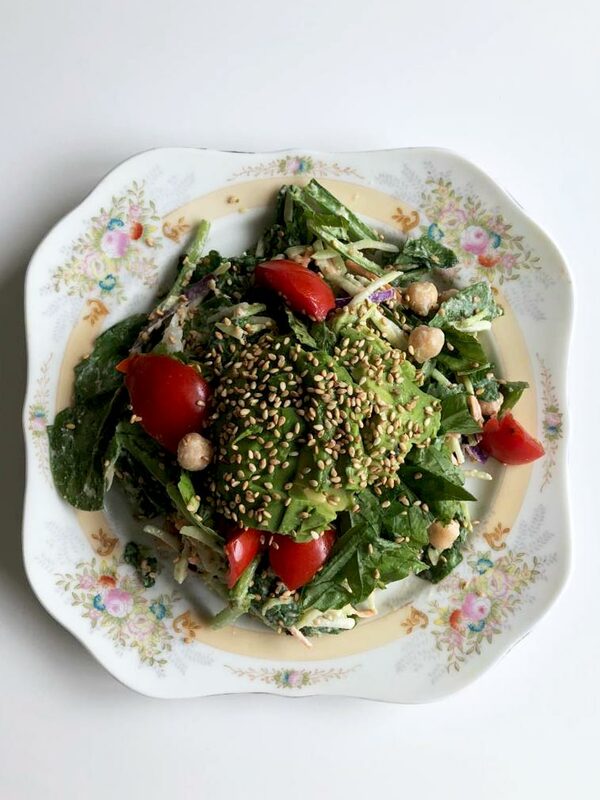 This lemon tahini dressing is really, the star of this dish. The combination of tahini (sesame paste), lemon juice, and chickpeas makes it a thick, creamy delight. It’s kind of like a combination of hummus and salad dressing. The fresh basil really brings forward a bright, refreshing flavour. Using a blender— any on this list will do—add a bit of water to emulsify the dressing ingredients. Blend until the dressing is smooth and creamy. The final product will be quite similar to a ranch dressing. Add some herbs, bell peppers and a dash of mustard to give it more of a “Ranchy” taste. A few drops of soy sauce or tamari and 1 tsp of miso paste will make it into a creamy Asian dressing. Use some of your favorite hot sauce to turn this into a “Buffalo” slaw! If you don’t have a blender, you can omit the chickpeas in the recipe and simply mix half (not a whole lemon) juiced lemon, the tahini and the other ingredients with a fork or whisk. It’s a little more work, but it’s just as delicious. I prefer to season the salad directly with salt and pepper after it’s been tossed in the dressing. This allows the flavor to stay on the surface of the food, giving it a fresher taste. You can also use a lot less salt this way and keep the flavor. Consider getting a grinder of dried and roasted garlic and sea salt at your local grocery store. It’s an easy way to make any veggies delicious on the fly. Once you’ve mastered the base recipe, you can do more with this if you want. Consider tossing in fresh or cooked veggies. Even frozen veggies can be steamed, cooled and added for additional texture and flavour. Bell peppers, shredded carrots, and peas would all be great additions. Depending on what veggies you use, this can be a very visually appealing dish with bright pops of colour and textures. Dress it up with slices of avocado and cherry tomatoes for an added colour and flavour boost. This dish is filling and satisfying. It can be served on its own, as a sandwich, in a wrap, or you’re going to love it served with this Crispy Baked Chicken Thighs and Sweet Potato Fries. Not only is this Mayo-free Coleslaw With Lemon Tahini Dressing a total game changer, but it’s also incredibly simple to create. If you’re looking for more delicious and easy recipes that are incredibly healthy, download your free 5 Ingredient Cookbook and instantly get 5 days worth of healthy living tips delivered straight to your inbox. A mayo-free coleslaw that still contains a creamy (and dreamy) dressing that will rock your wold is here. Add slaw, spinach leaves and chickpeas to a large bowl or container for mixing. Prepare the lemon tahini dressing by blending all the ingredients or mixing with a fork. Pour dressing onto the salad and mix using a fork. During the mixing process, add salt and pepper to taste. Distribute into bowls or plates and garnish each bowl with avocado, tomato, sesame seeds and basil as shown in the pictures. Joey Bruno runs the blog ThriveCuisine.com. He loves creating recipes from whole-plant foods and testing the latest in kitchen gear. 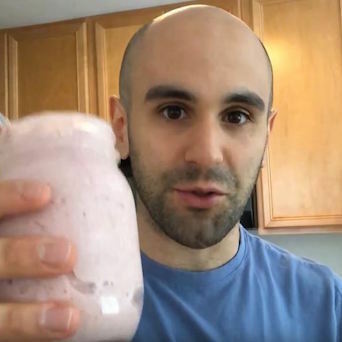 You can find him on YouTube messing around with blenders or on the website. When he's not in the kitchen, he loves traveling and spending time with his wife and dog.